Who can resist a cute pair of hot pink flip flops? We can't! We love all the hot neon colors showing up on everything from decor, to fashion and crafts! Why not combine them all by creating a bright summery deco mesh wreath that incorporates our favorite hues and our favorite summer flip flops? 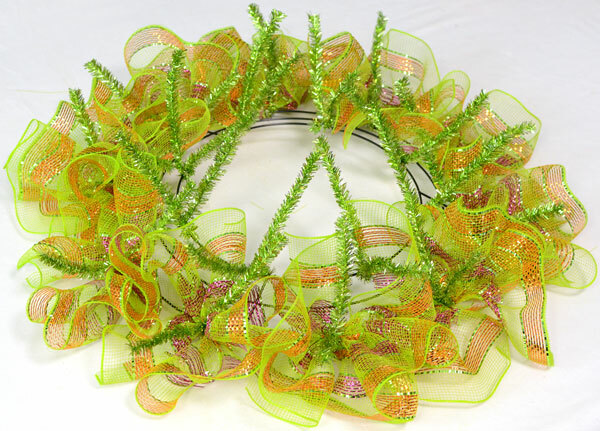 So here is our Summer inspired Flip Flop Deco Mesh Wreath! 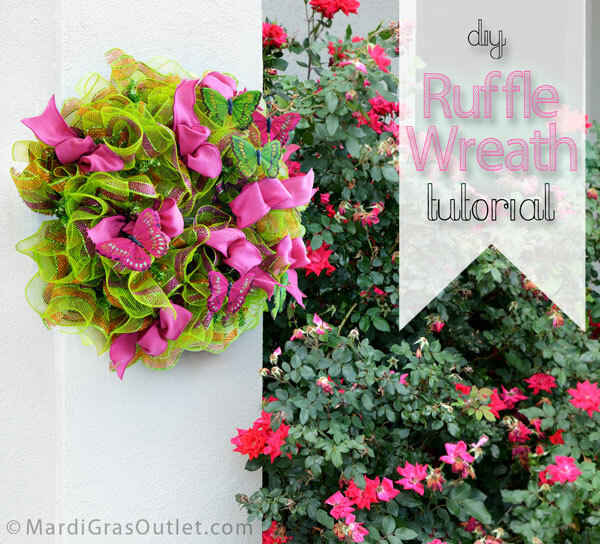 The DIY tutorial below features a brand new ruffled ribbon technique for filling a work wreath. This new look is not only easy to do, but also uses the smaller (an less expensive) 10" wide mesh rolls. This technique makes it very easy to add in multiple colors of mesh, different patterns of ribbon or fun textures of rope or wire (like the glitzy sticks we used). 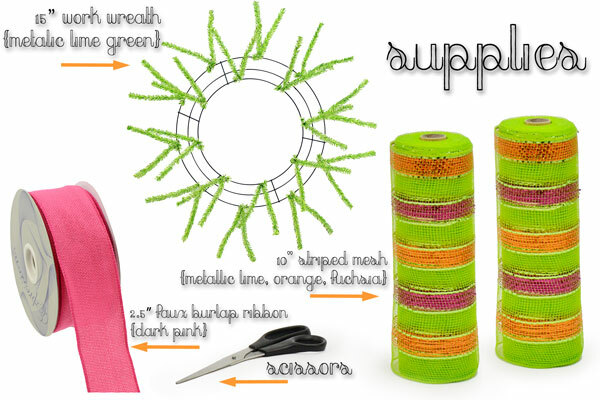 The cost of the supplies for a 1 color wreath is just under $30. We used about 1and 2/3 rolls of 10" mesh with some left over for additional projects. The entire wreath took about 45 minutes to create. 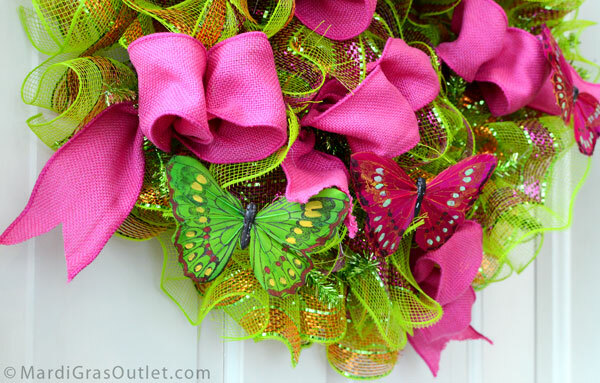 If you are interested in creating a ruffle wreath out of multiple mesh colors, a wide array of 10" mesh patterns and colors is available here. 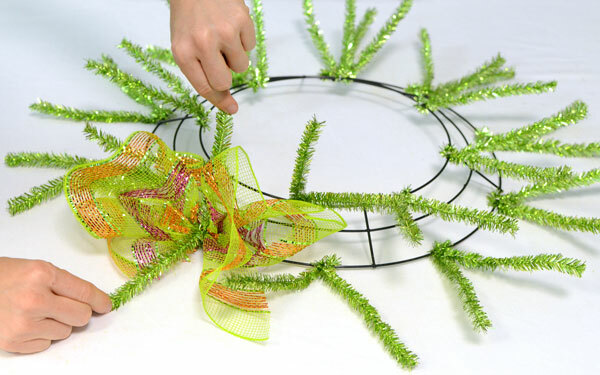 An important first step is to arrange and straighten the pairs of tinsel ties on your work wreath form as shown here. Measure off and cute 20 inches pieces of Deco Mesh from the 10" wide mesh roll. You will need to cut 26 pieces of mesh to fill the form, which uses a little less than 2 rolls. 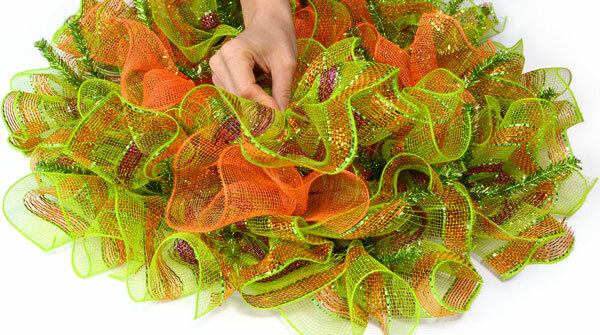 If you are using more than 1 color of mesh, you still only need a total of 26 pieces of mesh for a 15" work wreath. One piece of mesh will go into every pair of ties on the outside ring of the wreath, and 2 pieces will go into every pair of ties on the inside ring of the wreath. When you are making Ruffles you are essentially creating a pinch pleat. Unroll one of the 20" lengths of mesh, then pinch and pull it towards you using your fingers. Keep the entire piece pinched firmly until you get to the end, and holding it at the center, place into a set of ties on the wreath form. 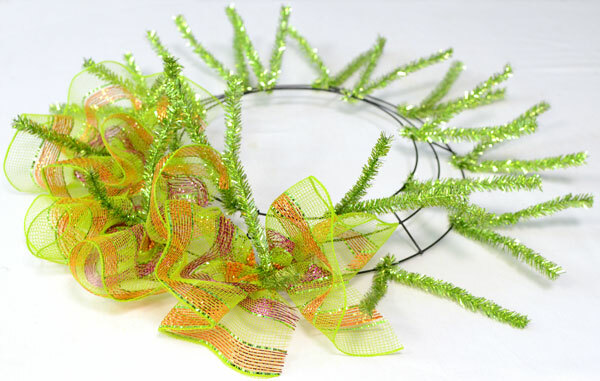 Place your ruffles in the tinsel wreath form beginning with the outside ring. Once you have place a ruffle in between a set of tinsel ties, twist the ties tightly together twice to secure. In the outside ring you should add one ruffle for every set of ties. Continue adding ruffles around the wreath form. Fill in the outside ring before moving to the center ring. 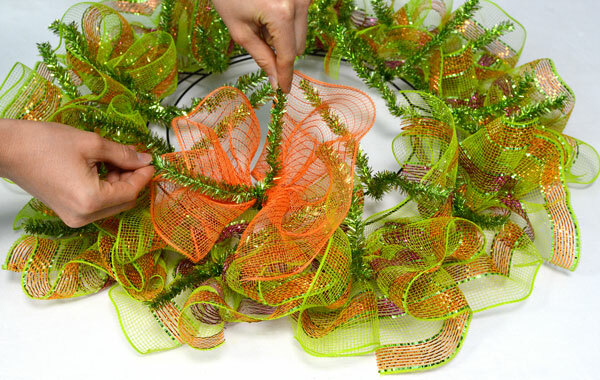 The tinsel ties located in inner ring of the work wreath should have 2 ruffles each. This will make your wreath look much more full. In the photo above, we used a different color mesh so that the process of stacking the ruffles was easier to see. Add a second ruffle directly on top of the the others in the inner ring of the work wreath only. Use the tinsel ties to wrap over the top of the ruffle and twist the two ends together to secure. Our completed ruffled ribbon wreath. Now it is time to add themed summer accents. 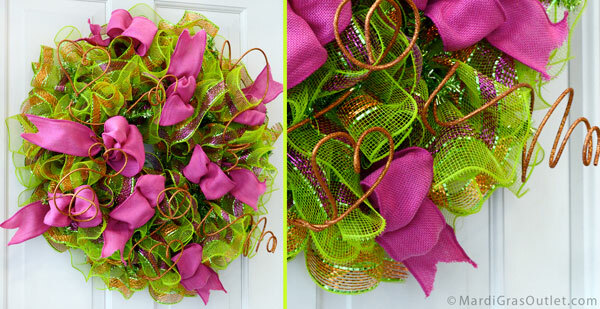 It's easy to add flip-flops and other summer accents to work wreaths! 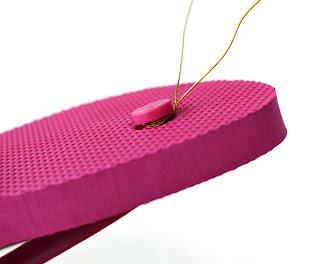 You simply wire them in using the tinsel ties.For each flip-flop we twisted a 9" piece of floral wire around the bottom of the toe strap. We then used the floral wire to attach to a tinsel tie. Here is how we made fun faux burlap ribbon tucks to add an additional burst of color on the wreath! If you are adding bow tucks into a work wreath, then you do not have to follow step 3- securing the tuck with floral wire. 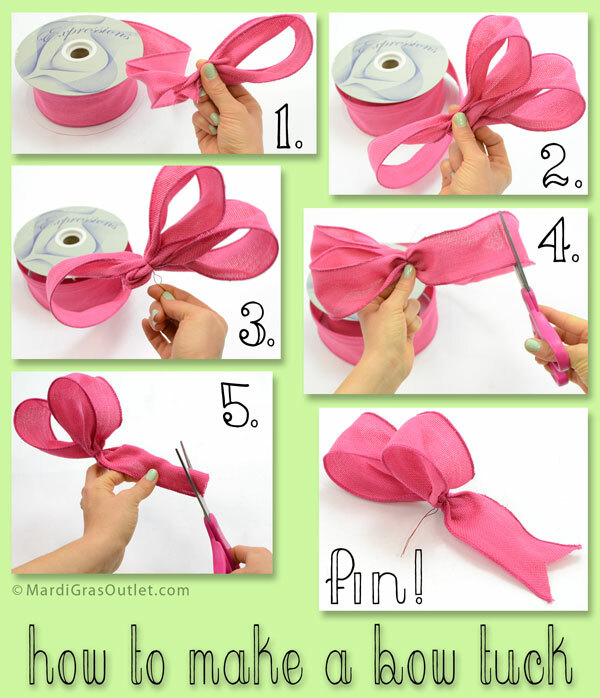 You will be able to add the ribbon tuck directly into the wreath by attaching them between a pair of tinsel ties and then twisting the ends of the ties together. 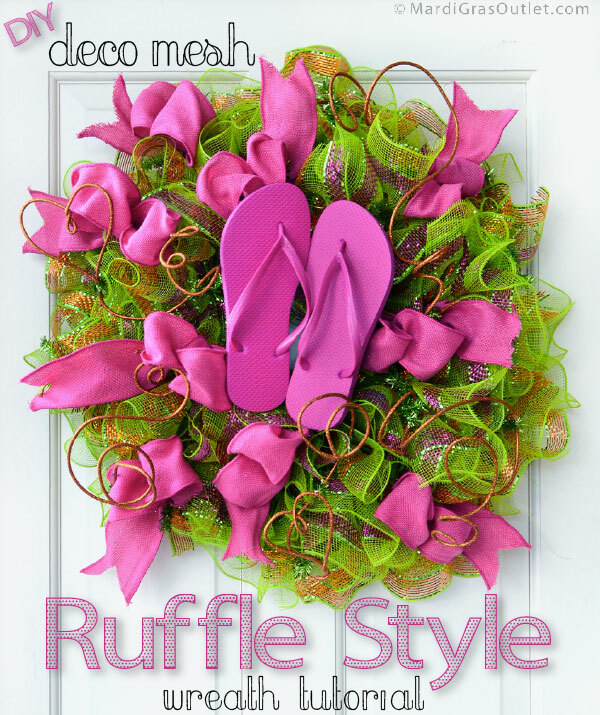 The Deco Mesh Ruffle Wreath with fun pink flip flops! 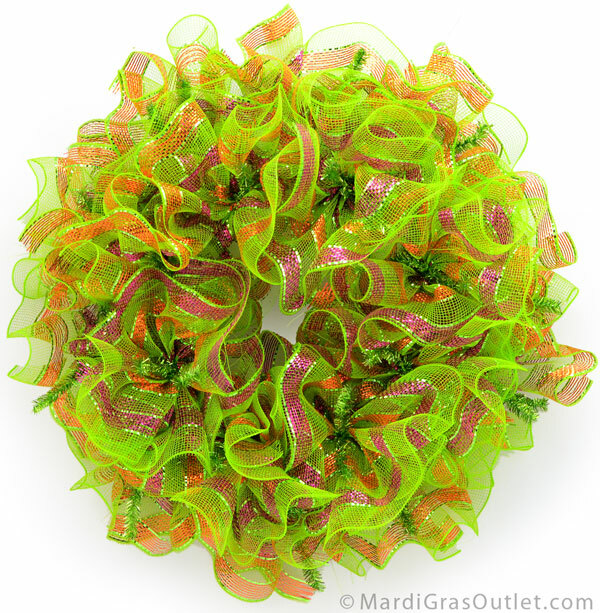 A second version of this ruffle wreath shows added sparkle and color with orange Glitzy Sticks! Glitzy Sticks are bendable, metallic sparkly wires that come in a large array of colors to match any craft or floral project. 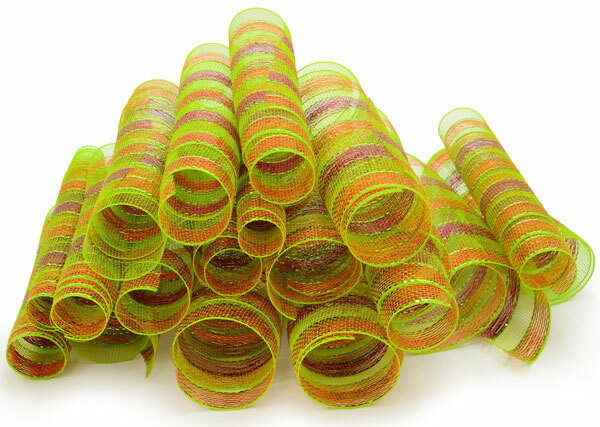 To match our Lime, Fuchsia, and Orange Deco Mesh we choose the Copper Glitzy Sticks which look orange. Butterfly Beauties. 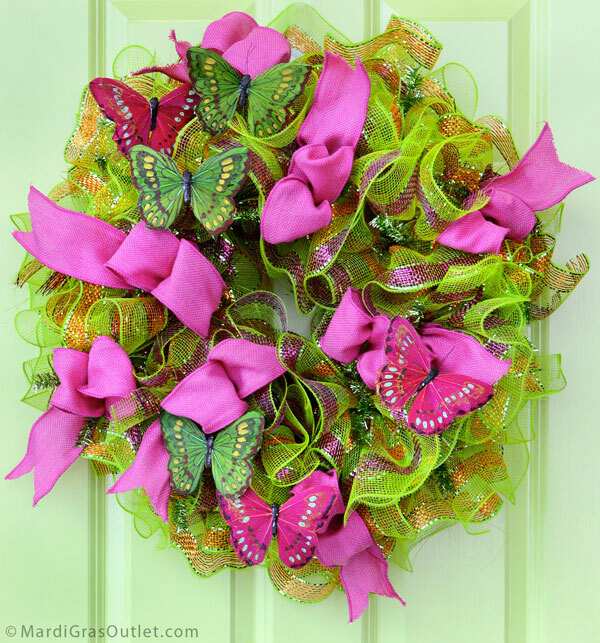 We also really loved the way our summer wreath looked with brightly colored feather butterflies. This botanical style would look beautiful on a garden gate. The great thing about these work wreath forms is your design options are infinitely changeable. Getting tired of the flip flop wreath? Switch those out for butterflies, or glitzy sticks or flowers. What will you create for your summer wreath? OH MY! what a FUNtastic wreath! I love how you incorporated the beautifulness of your wreath with the touch of summer fun, and the fact that you did a tutorial just floored me. I have been wanting to try this for some time and now your step by step (thank you) tutorial has given me the courage to try it! love YOUR BLOG! Thanks for the wonderful comment scrappychica! We hope the steps make it easier for you. We appreciate you following our blog :-) Let us know if you end up making the ruffle wreath, we would love to see pictures! I really want to try this but I wish that the before and after picture of the work wreath wouldn't blink in and out so that I could see the after picture better. Is there any way I could get a picture to see the ties?